Lincoln Center is about to kick off its 50th anniversary festivities on Monday. The kick off will begin with performances by the likes of Itzhak Perlman and Wynton Marsalis as a celebration of the future more than commemorating the past. 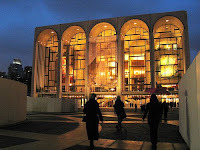 Last week, I had the opportunity to spend about an hour milling around Lincoln Center. What else is an out-of-work singer going to do while he waits for a call from the Met Opera Chorus... or the temp agent, perhaps. But, I digress. What I saw all around Lincoln Center were signs that the overhaul of the country’s largest performing arts center, is in it's final stages. Fountain hoses were being tested, lighting was being installed and temporary walls were being deconstructed. People have been hanging out on the new "bleachers" opposite Alice Tully’s entrance on the corner of Broadway and West 65th Street, and on the steps leading down to the front doors, just as Lincoln Center officials had hoped. I sat myself in the park across from the campus and watched the work being done. It's going to look stunning and will really boost the look and appeal of Lincoln Center. However, all of this remodeling comes at a price: $1.2 billion to be exact. In this economic climate, fund-raising can't be easy. One fund-raising effort is centered on the new Columbus Avenue staircase and promenade, which Lincoln Center is naming after soprano Beverly Sills. In her years at Lincoln Center, Sills not only sang countless seasons with New York City Opera, but she also presided as chairwoman of Lincoln Center and of the Metropolitan Opera, led the New York City Opera and served on the board of Lincoln Center Theater. To that end, donors are being encouraged to make gifts in her honor. Another way that Lincoln Center will help pay the bills is by turning over its plazas and theaters to the Fashion Week tents that for the last 16 years have filled Bryant Park for a week each February and September. The fashion shows will move in September 2010. The five year agreement is sure to bring in some serious money. For more on the Lincoln Center project - including artist renderings and a video about the beginnings of Lincoln Center - make sure to check out the New York Times. Congrats on the face lift, Lincoln Center! 50 never looked so good.